Looking for London Boat Show accommodation? Are you heading to ExCel for the London Boat Show and need a place to stay? Stay on a boat instead of a hotel and get close to the water before you check out the boats. Search for London Boat Show accommodation now. If you are visiting the London Boat Show at ExCel make it an all boat experience with Beds on Board. We have London Boat Show accommodation on canal barges, luxury motor yachts and the odd pirate ship so sleep on a boat instead of hotel during London Boat Show – it’s another way to stay! Why stay on a boat for London Boat Show Accommodation? Marinas, canals and rivers are unique places to stay and some are in close proximity to London ExCel, so perfect for your London Boat Show accommodation. Staying on a boat is a relaxing way to escape after the show or to explore the history, culture and entertainment of London. We have boats available in St Katherine’s Dock, Canary Wharf, N1, Little Venice and more. So there’s no better way to enjoy the London Boat Show than by staying on a boat with Beds on Board. Maybe you are looking to buy a boat at the show? If so, Beds on Board can help you try before you buy. Or maybe you just fancy a change from the usual hotels or B&Bs, so staying on a boat can be a unique experience. 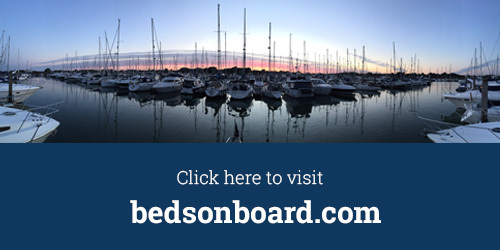 Visit bedsonboard.com today to book your London Boat Show accommodation, or call us on 0203 795 5006.